© Cartaz de Rui Silva. 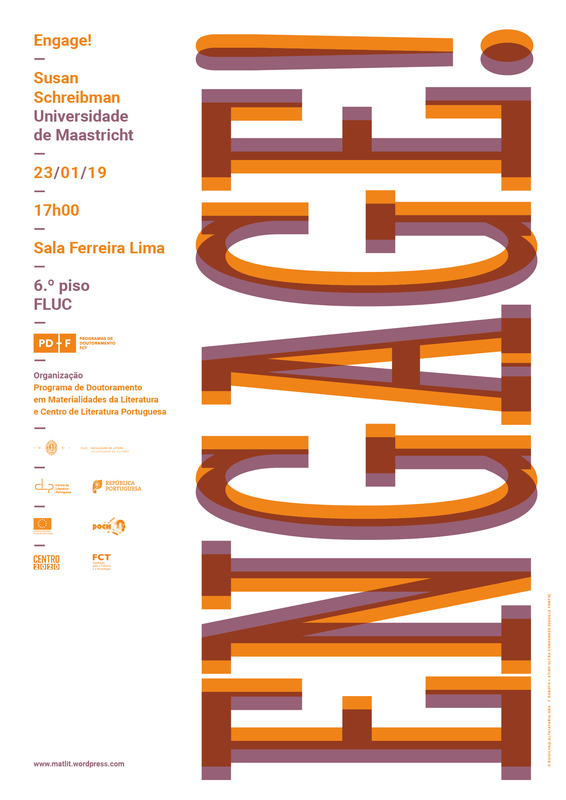 No próximo dia 23 de janeiro de 2019, pelas 17h00, na Sala Ferreira Lima (FLUC, 6º piso), terá lugar a oficina “Engage!”, organizada por Susan Schreibman (Universidade de Maastricht). Trata-se de uma organização do Programa de Doutoramento FCT em Materialidades da Literatura, com o apoio do Centro de Literatura Portuguesa. As Steven Lubar has argued, “public engagement” has to come “not after the scholarship, but as part of the scholarship.” And yet figuring out how to build public engagement into the design of a research project can be challenging for many scholars. This workshop will provide a hands-on exploration of best practices in designing and executing community-engaged projects. Along the way, we’ll explore a wide range of questions including what does engaged research look like in the literary and historical studies? What are the benefits and challenges involved in creating scholarship that engages the public? How does one select and support engagement opportunities that serve the interests of the community and the research? What can be learned from successful and unsuccessful public engagement projects? How does one identify and establish relationships with specific communities to foster strong and productive partnerships? The goal of this workshop is to explore these topics through a participatory process in which participants will play a board game in which players are asked to role-play their way through various challenges involved in designing and executing publicly engaged research projects. Groups of participants will be encouraged to strategize ways of planning and scaffolding specific types of activities that involve rich humanities and meaningful public engagement. Susan Schreibman was the founder of the Digital Humanities Programme at Trinity College, Dublin, and she is currently Professor of Digital Humanities at the University of Maastricht. She was Director of An Foras Feasa, the Humanities Research Institute, at Maynooth University (2014-2018), and Director of the Digital Humanities Observatory (2008-2011), a national digital humanities centre developed under the auspices of the Royal Irish Academy. Previously she was Assistant Dean for Digital Collections and Research, University of Maryland Libraries (2005-2008), and Assistant Director of the Maryland Institute for Technology in the Humanities (2001-2004). Her book publications include Collected Poems of Thomas MacGreevy: An Annotated Edition (1991), A Companion to Digital Humanities (2004), A New Companion to Digital Humanities (2016, new updated and revised edition), and A Companion to Digital Literary Studies (2008). She is the series co-editor of Topics in the Digital Humanities (University of Illinois Press) and the founding Editor-in-Chief of the peer-reviewed Journal of the Text Encoding Initiative. She is the principal investigator of two major digital projects: The Thomas MacGreevy Archive (2000-2007) and Letters 1916-1923 (2013-2017). She is a member of the External Advisory Committee for the PhD Programme in Materialities of Literature at the University of Coimbra since 2013, and was a consultant for the LdoD Archive project (2012-2015).